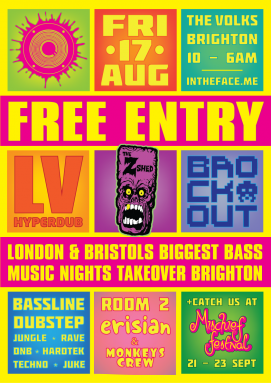 Last summer we treated you guys to a packed free event, and now we’re doing it again, this time with the mighty L.V. 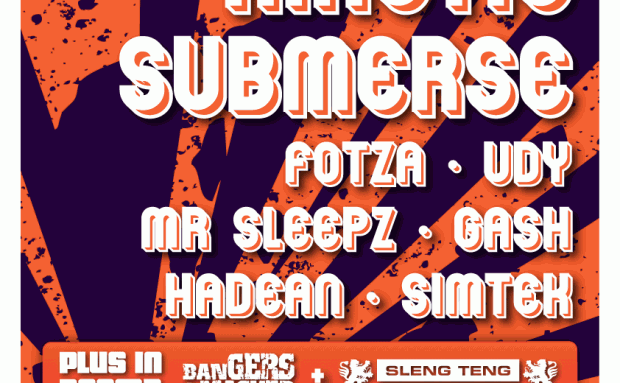 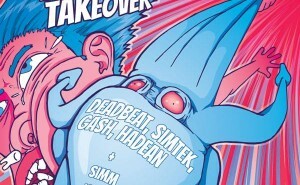 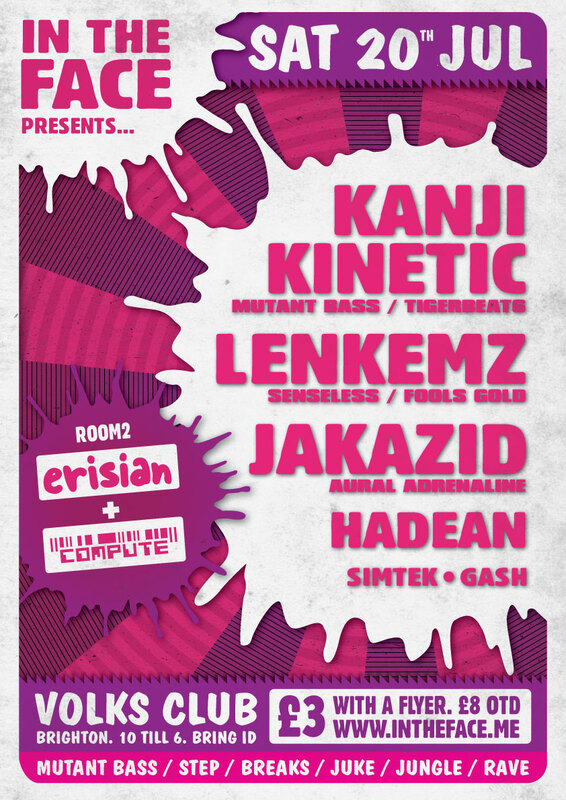 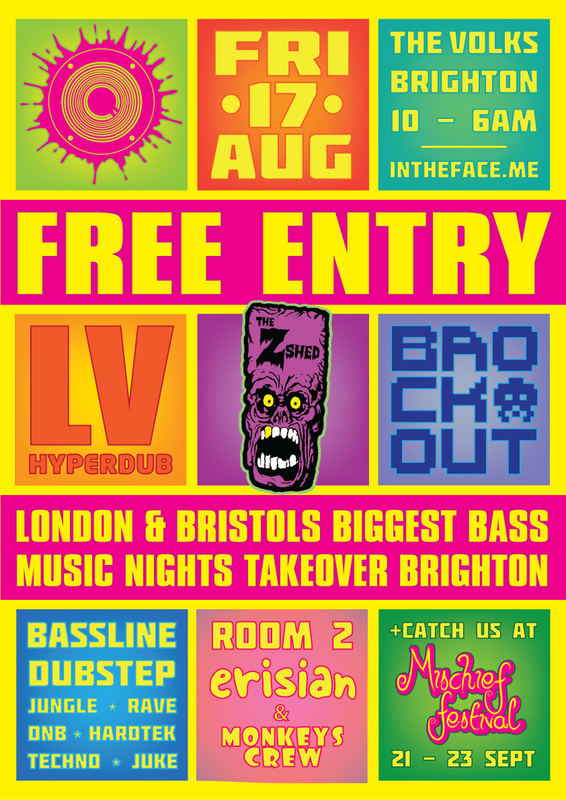 headlining, together with London & Bristols biggest bass nights, Z-Shed and Brock Out! 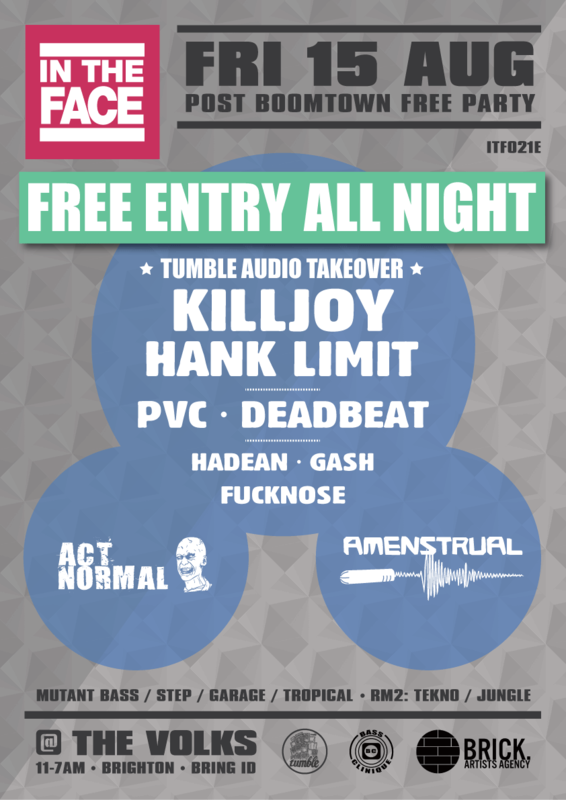 Make sure you check out the Facebook event for full info. 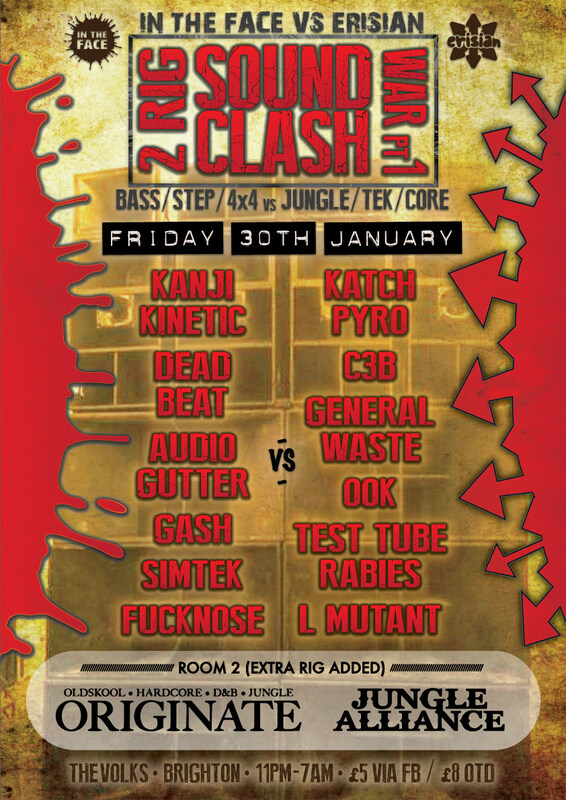 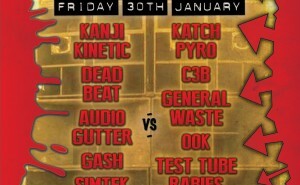 Brighton vs London vs Bristol vs LV…..FIGHT!! 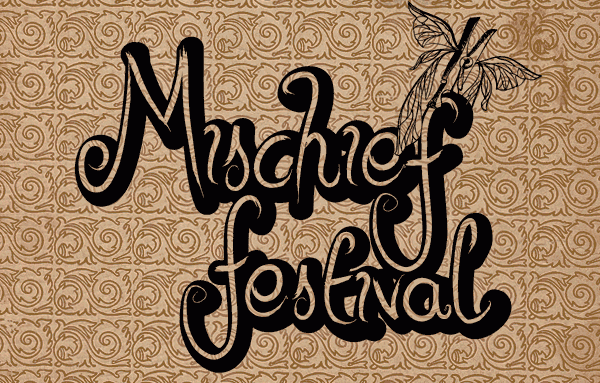 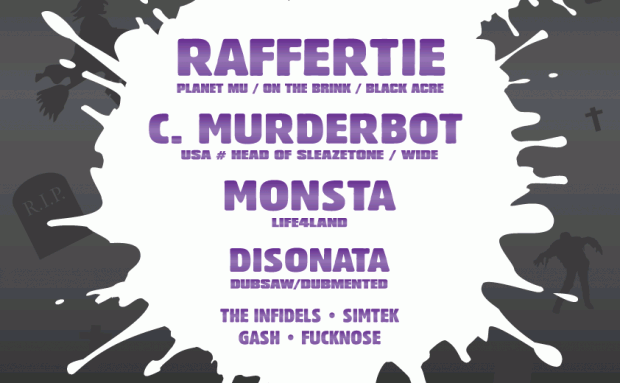 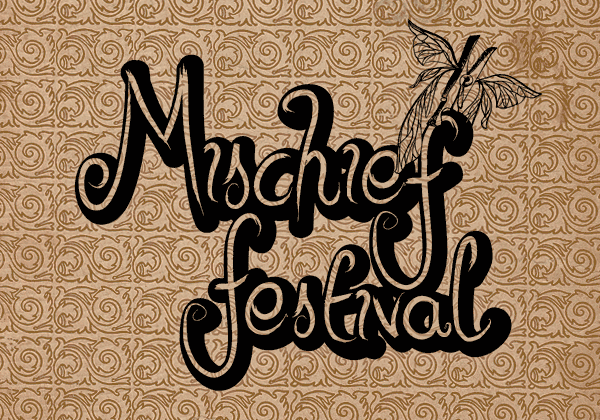 Catch In The Face at Mischief Festival this year! 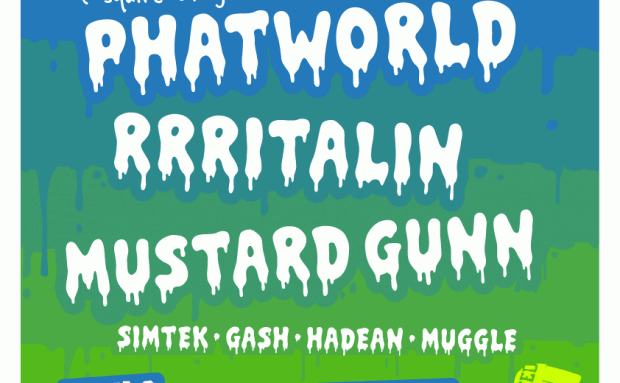 The Mischief crewdem are known for putting on bangin parties and this is guaranteed to be an absolute stormer, featuring 6 stages of everything from acoustic to hardkore. 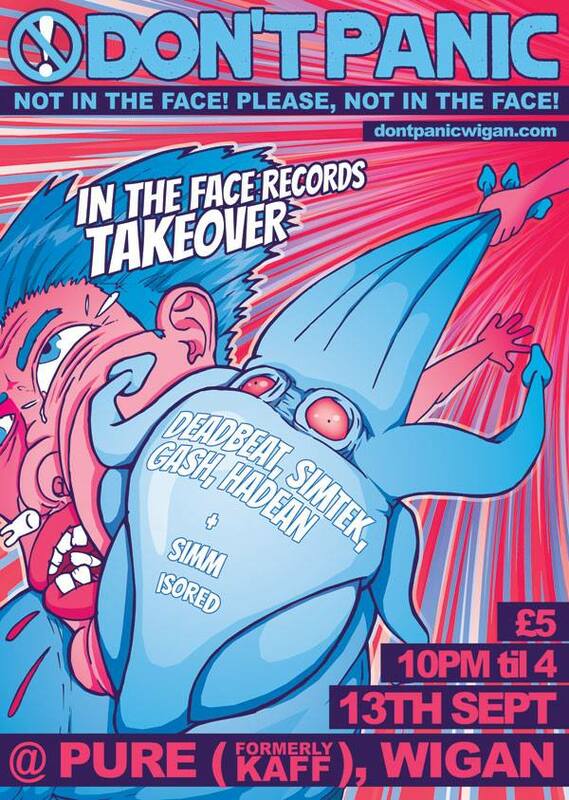 Our latest event is going to be a blinder, we have a Coin-Op Records Takeover for our 2nd Birthday night! 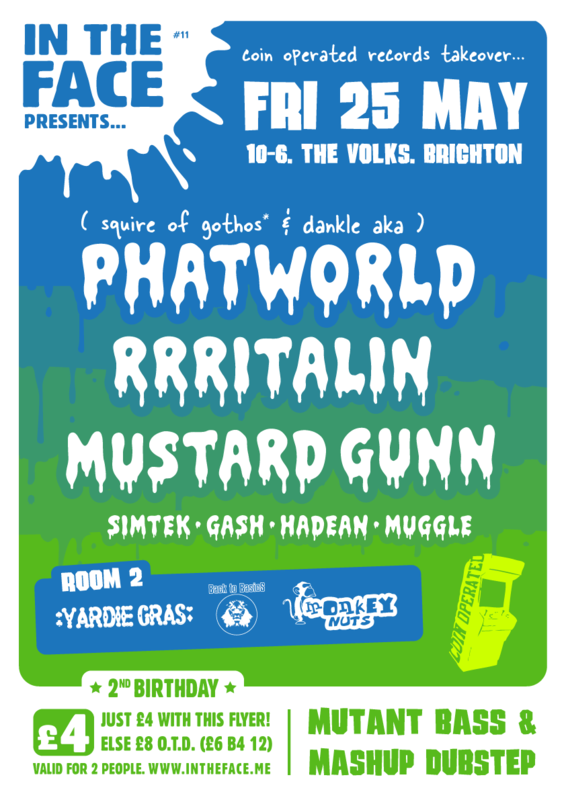 Phatworld (aka Squires & Dankle) bringing some seriously funky bassline to get you moovin’ & groovin and joining them the absolutely mental rave bass stylings of Rrritalin and the godfather of the genre Mustard Gunn. 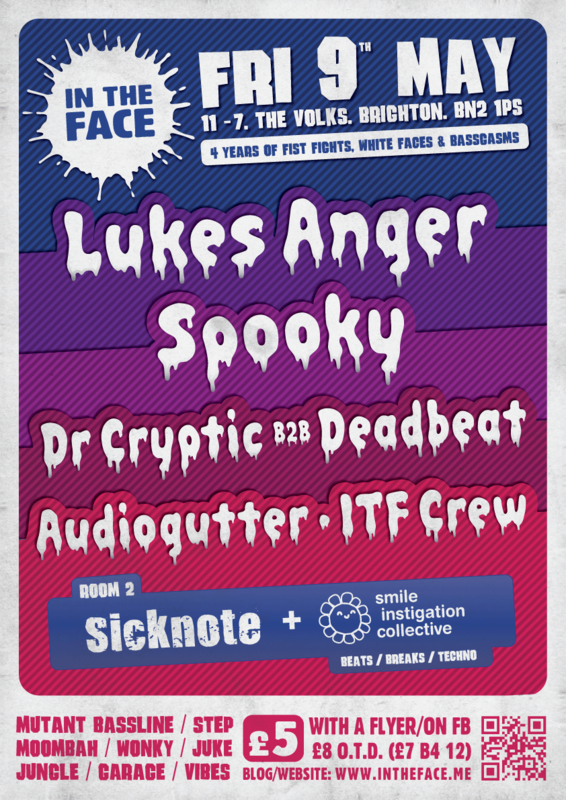 A special 2nd Birthday price of £4 via the facebook event, or with a flyer! 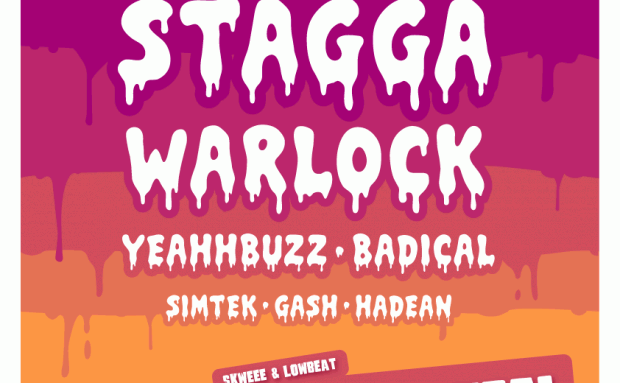 Our next outing is a Rag & Bone showcase featuring Stagga & Warlock. 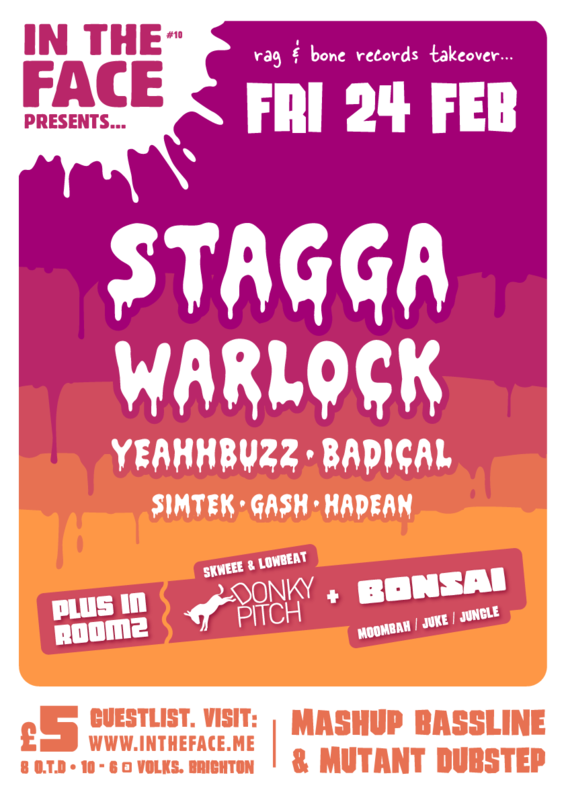 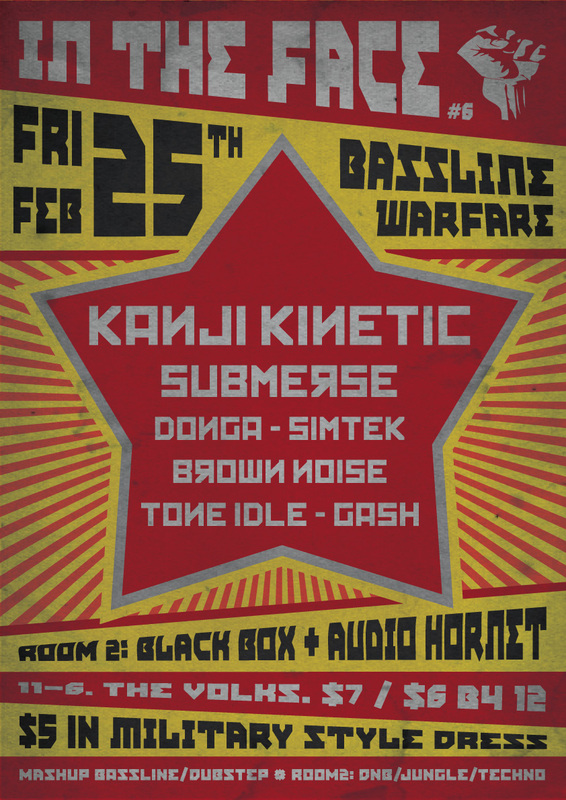 We’ll also be playing host to Yeahhbuzz and are joined by the Donky Pitch and Bonzai crews in Room 2. 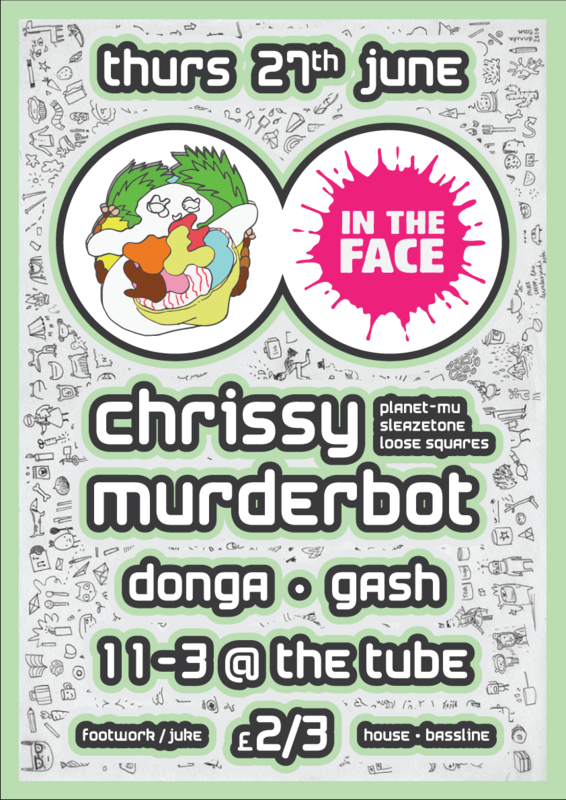 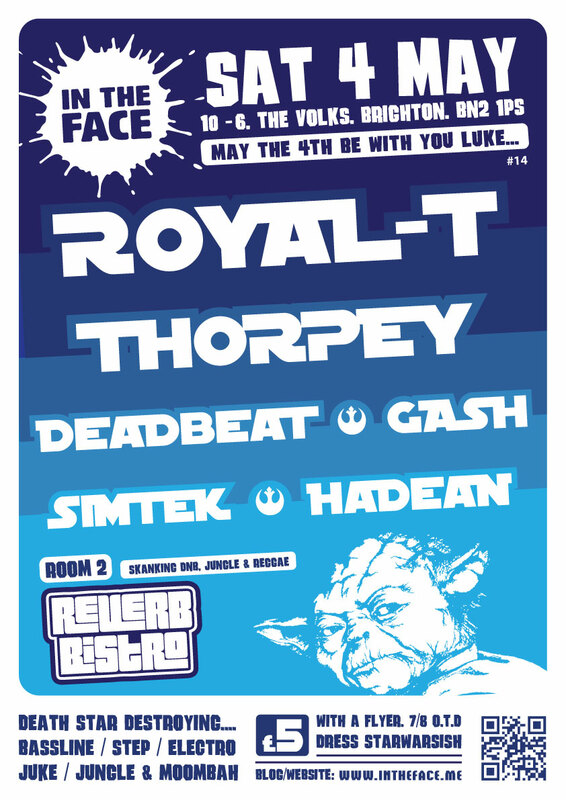 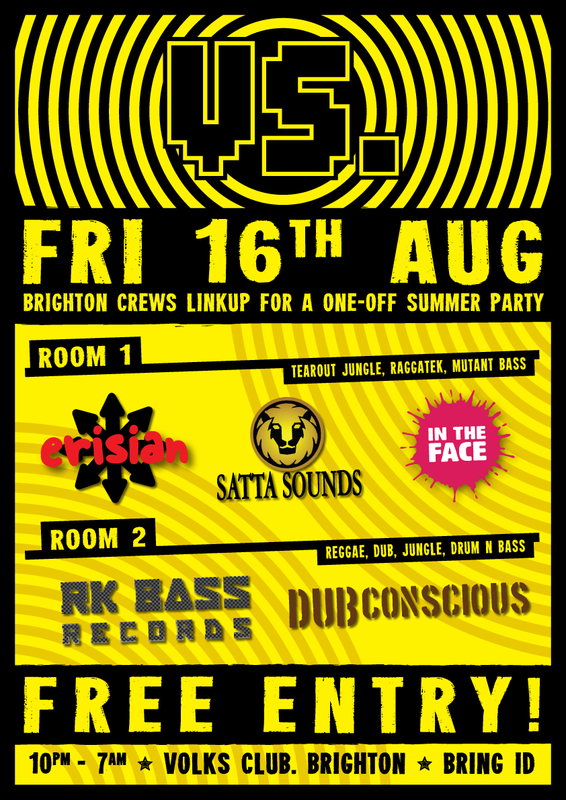 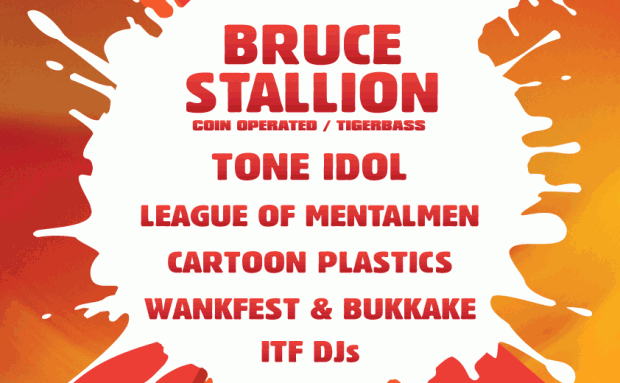 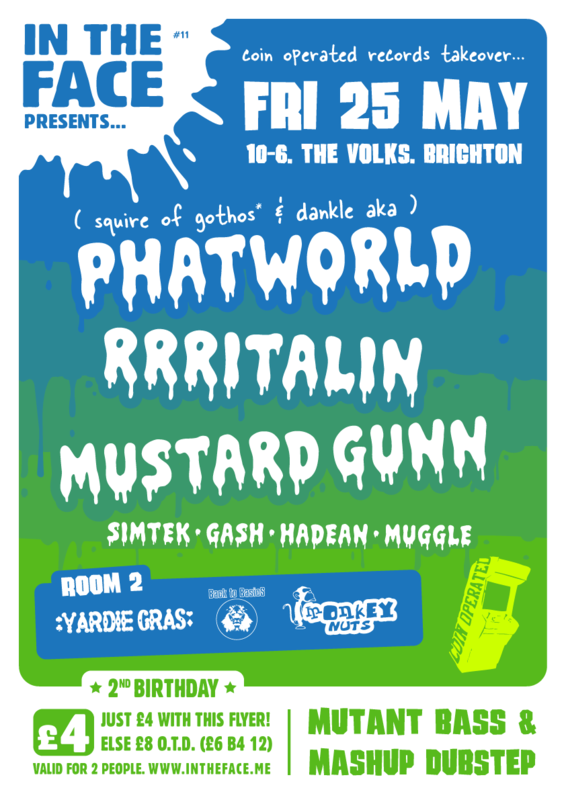 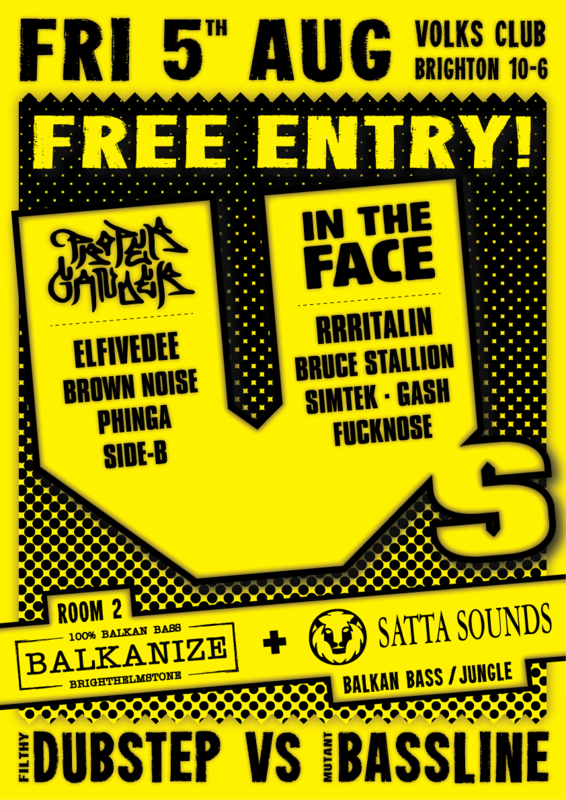 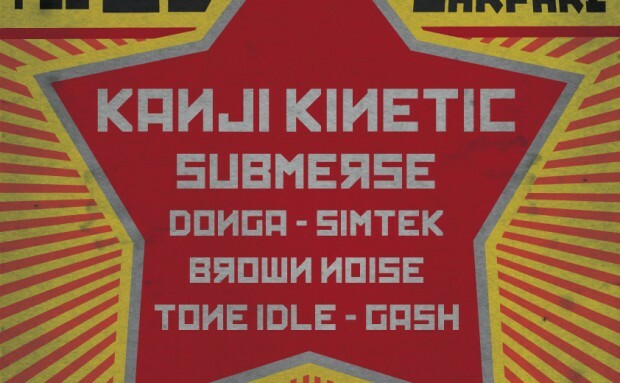 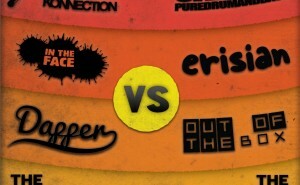 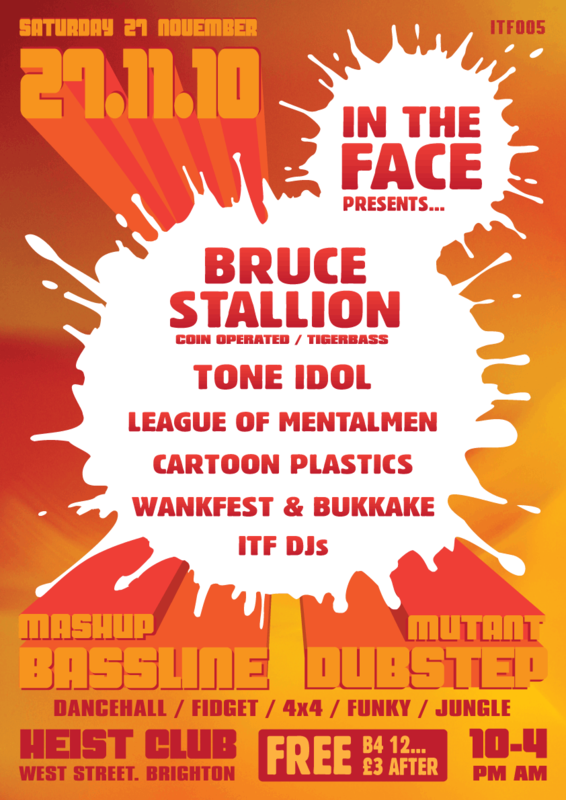 UNDOUBTEDLY THE DIRTIEST BASSLINES IN BRIGHTON THIS SUMMER …& IT’S FREE !!! 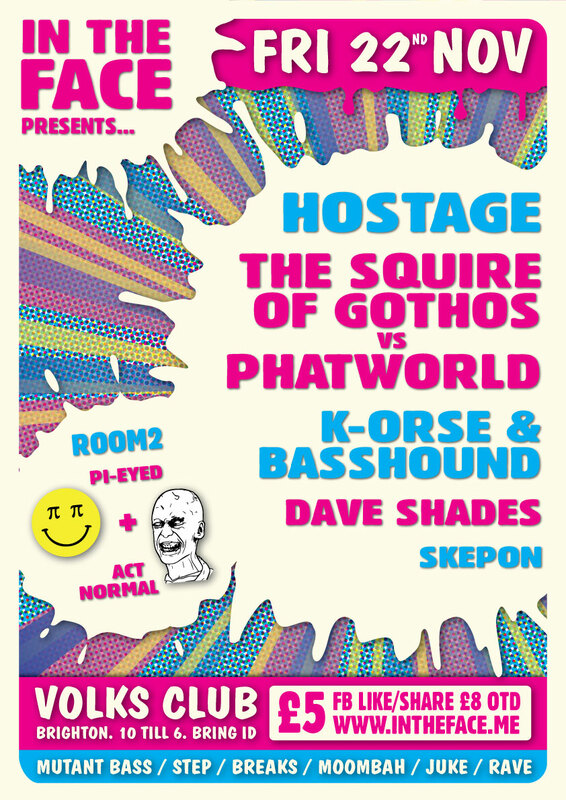 As it’s our first Birthday we thought we’d celebrate in style, and not only get Squire of Gothos (who played our very first night back in May last year) but also a whole bunch more of their labelmates all the way from Sheffield to bring you some mental basslines OFF ME NUT STYLE!!! Military themed fancy dress for this one with prizes for the best dressed. 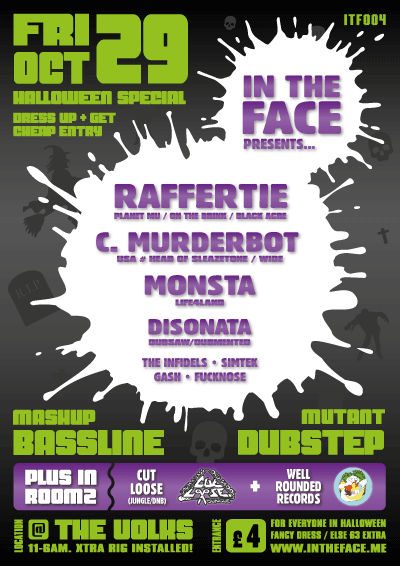 Halloween fancy dress. 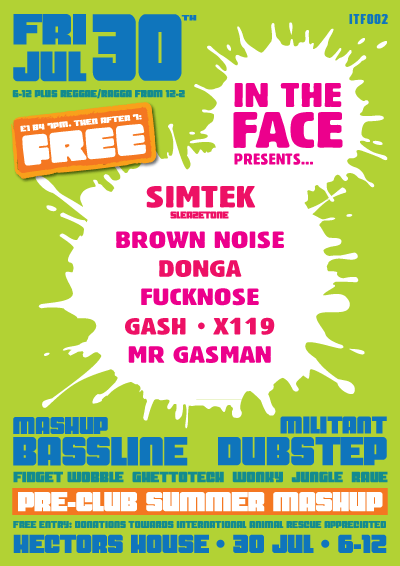 For those that make an effort it’s a treat worthy £4, and for those that don’t it’ll set you back a tricky £3 extra. 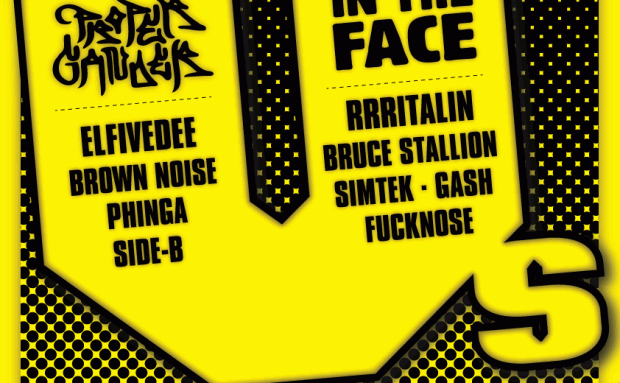 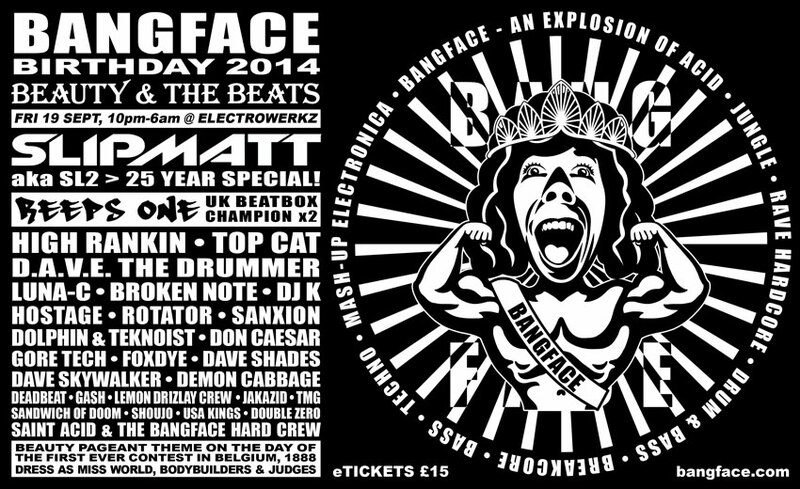 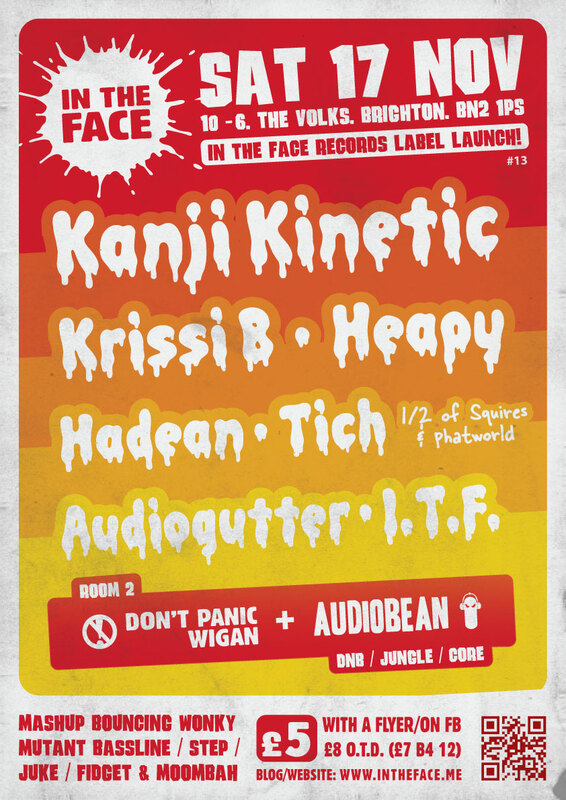 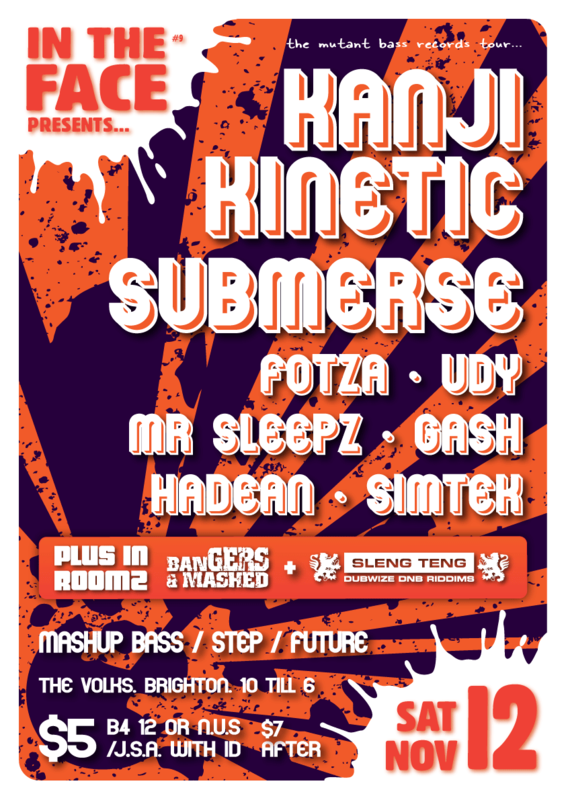 Bangface returns to London on September 19th with an exceptional lineup for their birthday bash, including Slipmatt/SL2 (a 25 year special set) as well as High Rankin, D.A.V.E. 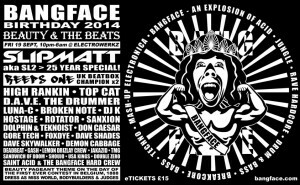 The Drummer, Top Cat & more. 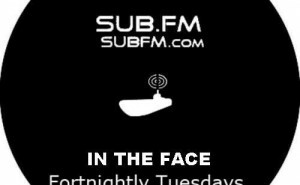 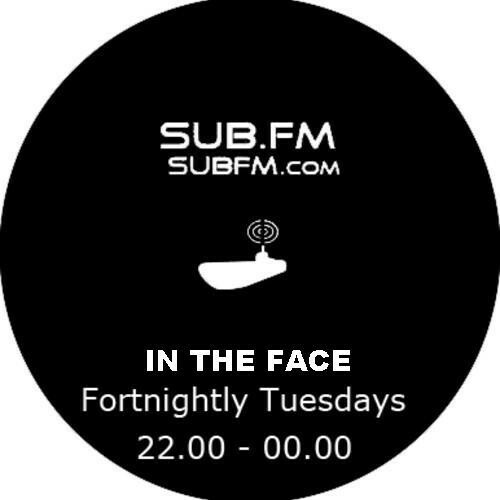 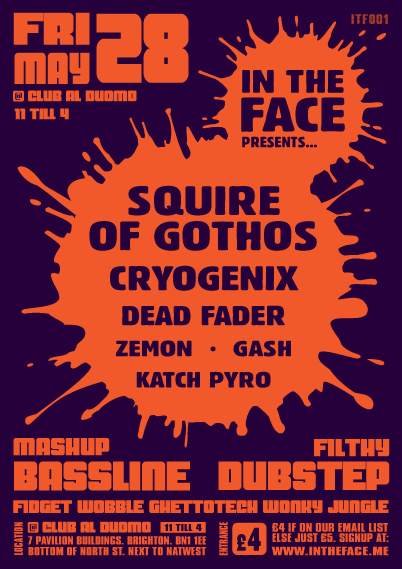 Also joining them are In The Face’s very own Gash & Deadbeat who will be going back to back and bringing you the freshest bassline, garage, grime & more. 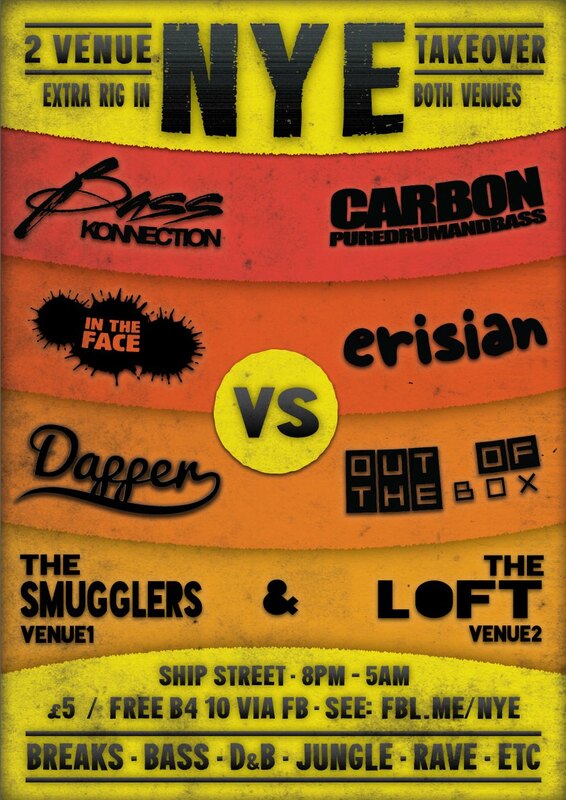 Its gonna be a banger!